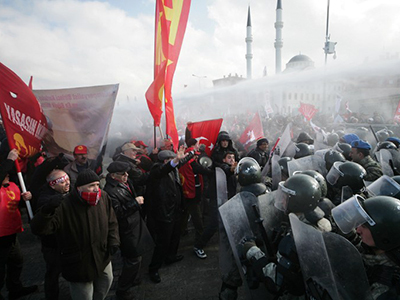 Thousands of protesters in Istanbul clashed with police in the most violent rally Turkey has seen in years. Hundreds have been injured and dozens arrested in fierce rioting which the media has dubbed the Turkish Spring as it spreads across the country. The protests in Turkey have entered their second day Saturday morning, with police trying to disperse crowds in Istanbul and Ankara with teargas and water cannons. The bridge over the Bosphorous Strait in Istanbul was blocked by thousands of protesters heading west from the eastern part of the city, trying to reach Taksim Square, cordoned off by police. — azize çayan (@azizecyn) 1 июня 2013 г. The Friday morning police crackdown on peaceful Occupy-style protesters rallying against the demolition of a landmark park in Istanbul, have over the day and night grown into massive street battles with police using teargas and water cannons against thousands of demonstrators and rioting spilling over to other Turkish cities, including the capital Ankara, and the Aegean coastal city of Izmir. What started out as a protest against cutting down trees in the Istanbul Gezi Park turned into a broader demonstration against Prime Minster Tayyip Erdogan’s Islamist Justice and Development Party (AKP), which the demonstrators accuse of having grown increasingly authoritarian. “This isn’t about trees anymore; it’s about all of the pressure we’re under from this government. We’re fed up; we don’t like the direction the country is headed in,” Mert Burge, an 18-year-old student, who came to support the protesters after he heard about the use of teargas via twitter, told Reuters. At least 12 people including a pro-Kurdish MP and a Reuters photographer, suffered trauma injuries in the clashes. Six of the injured are suffering from serious head trauma. A 34-year-old Egyptian tourist is undergoing an operation after suffering a brain hemorrhage, Huseyin Demirduzen, from the Istanbul Medical Chamber board, told Reuters. Meanwhile a member of the opposition Peace and Democratic Party is in intensive care in a serious condition. 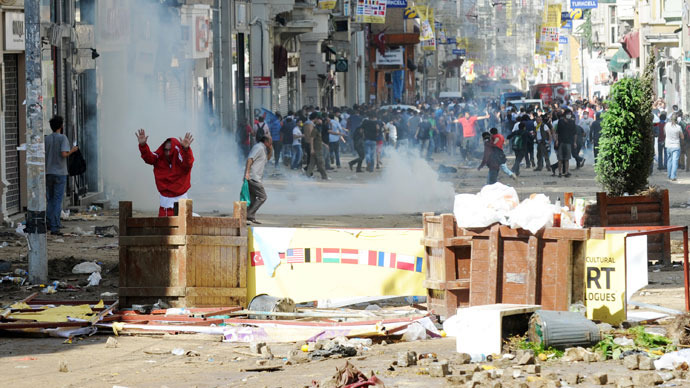 Hundreds more suffered respiratory problems due to the effects of tear gas, Demirduzen said. Several people were injured after a wall they were trying to climb in an attempt to get away from clouds of teargas collapsed underneath them. In Ankara, police also used teargas to disperse protesters trying to reach the headquarters of the ruling Justice and Development Party (AKP) in support of the anti-government rioters in Istanbul. Earlier, an Istanbul deputy of the AKP, Sirin Unal, tweeted his support of the police’s heavy-handed response. “Obviously there are some people in need of gas. 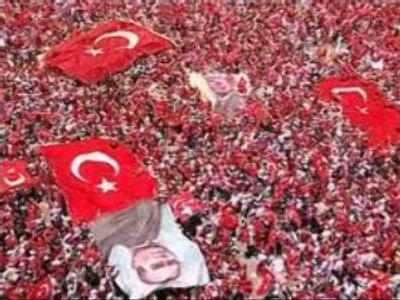 If you leave [Taksim Square] I hope you will have a good day, the system needs to be obeyed,” he wrote. The opposition Peace and Democracy Party described the police intervention as “state terror” in an emailed statement. Amnesty International said that it was concerned with “the use of excessive force” by police after what started as a peaceful protest. The US State Department also appears unhappy with the number of injuries and is conducting its own investigation of the incident. 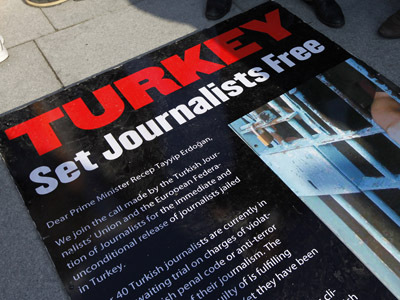 "We believe that Turkey's long-term stability, security and prosperity is best guaranteed by upholding the fundamental freedoms of expression, assembly and association, which is what it seems these individuals were doing," State Department spokeswoman Jen Psaki said. The protest at Gezi Park, next to Taksim Square, started on Monday after developers started tearing up trees, as part of the government plan to make way for a replica Ottoman army barracks and a shopping mall. Demonstrators say they defend the last green space of any size in the center of Istanbul. Late Wednesday the main opposition leader, Kemal Kilicdaroglu from the Republic People’s Party (CHP) made a surprise visit to the protest camp of several hundred demonstrators and promised that members of his party would take turns to help the protesters stop an attempt to bring back the bulldozers. In the first raid against crowds on Thursday, police used a Mass Incident Intervention Vehicle (TOMA) to disperse them before seizing and burning some of their tents, according to the Hurriyet Daily News. On Friday evening, an Istanbul court ordered the temporary suspension of the project to uproot the trees in the Gezi Park. In a speech on Saturday, Tayyip Erdogan said he would push ahead with plans to redevelop Istanbul's central Taksim Square despite violent protests, according to Reuters. The Turkish PM earlier defended the decision concerning the redevelopment of the Gezi Park, saying “Whatever you do, we’ve made our decision and we will implement it, we will revive history there.” Although the government has denied that the mall is part of the plan, insisting it needs the space to widen a nearby road and ease traffic congestion, according to RTE News. Erdogan has said he wants to introduce an Ottoman cultural revival. As well as a more assertive foreign policy, more conservative policies are also being gradually introduced at home. 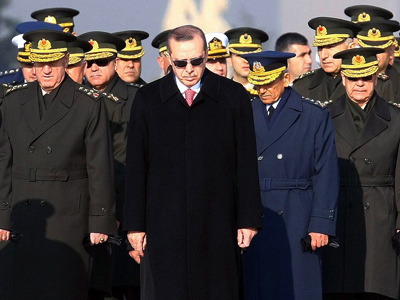 He is also authorizing a slew of multi-billion dollar projects aimed at reflecting Turkey’s reemergence as a major power, including a third airport in Istanbul, which will be one the world’s biggest and a shipping canal as big as the Suez or Panama canals. Turkey recently saw massive anti-government protests on May Day, when police clashed with tens of thousands of demonstrators in Istanbul, and there have been several smaller protests against tightening of alcohol sales and warnings against displays of public affection as well as the government’s stance on the neighboring Syria conflict.